The next European Parliament elections are due to be held in May 2014. Ahead of the elections, Doru Frantescu assesses the voting trends and balance of power in the current parliament. He notes that although the European People’s Party currently has the largest share of seats, there is a difference between the nominal power of parliamentary groups and their actual power. Factors such as voting cohesion and participation, as well as the coalition dynamics, have an influence on the extent to which parliamentary groups are successful, with larger groups tending to be the most effective. The date of the next European elections is approaching and the debate on the EU seems to heat up from day to day. From 2014 on, the European Parliament (EP) will have a new composition, which will shape the political trajectory of the European Union for the next five years. In order to understand what is at stake in the May 2014 elections, a critical look on what has been done in the EP’s first post-Lisbon term is necessary. To this end, this article analyses the main voting trends in the European Parliament. Firstly, who makes the running in the European Parliament, who holds the power? The capacity of a political group to influence the outcome of legislation is not limited to the group’s size (nominal power). A full assessment of its strength has to also factor in the degrees of cohesion and participation (actual power) when voting, as well as its coalition potential. 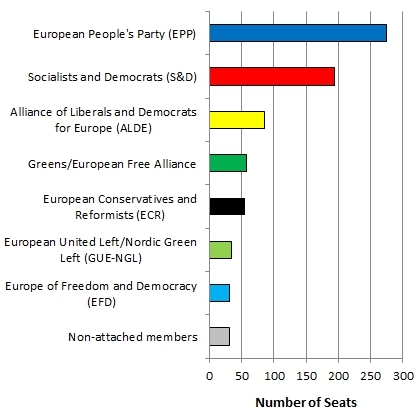 As Chart 1 shows, In terms of number of seats the European People’s Party (EPP) is currently the largest group, followed by the Socialists and Democrats (S&D). The EPP is also the group which has won most votes in the EP plenary (89 per cent). However, given that there is no stable government-opposition system at EU level, and none of the groups holds an absolute majority, the coalition dynamics operate in such a way that in some policy areas smaller groups win more votes than the EPP. However, the composition of the EP will change after the May 2014 elections, as the Eurosceptic and radical groups are predicted to increase their number of seats (and, consequently, their nominal power), which may impact on the dynamics and, eventually, on legislation. Voting cohesion in the 7th legislature of the EP has increased slightly, which might come as a surprise if we take into account that the MEPs vote more often on legislative issues than before the entry into force of the Lisbon treaty. On average, the largest groups in the EP are the most “disciplined” ones, their members tending to be more united. However, the cohesion varies significantly from policy area to policy area. For example, the EPP is more cohesive than the S&D when voting on agricultural issues, but is less cohesive when it comes to votes in the civil liberties area, as shown in Charts 2 and 3 below. On the other hand, voting participation rates vary little across policy domains. 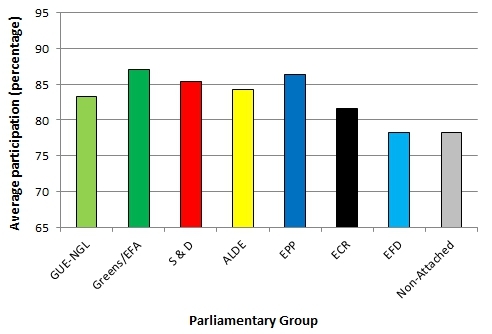 The Greens are the group that participates the most in votes, followed by the large groups. 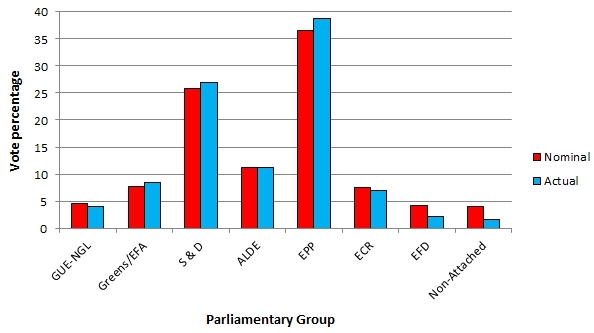 The radical groups (both on the left and right), tend to participate less, resulting in their impact on the final legislation agreed in the parliament being reduced. Chart 4 shows each group’s average participation in votes. A glimpse at the results of votes on different legislative areas shows that the power of a political group varies from domain to domain. Generally, the largest groups have even more actual power than nominal, due to their higher levels of cohesion and participation, while the radical groups’ actual power lags behind the nominal one, as their members show up to vote less often and are less united. Chart 5 below shows the difference between the nominal power of each group and their actual power in the parliament. Note: The red bars show a group’s nominal power, which is a reflection of the number of seats they hold in the Parliament. 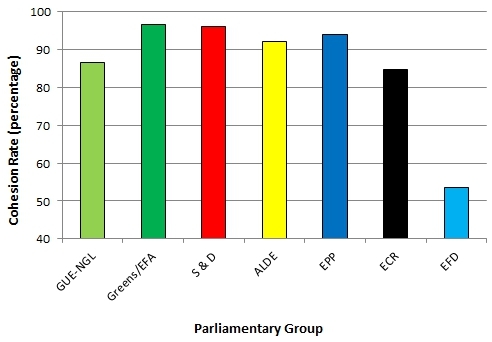 The blue bars show a group’s actual power: the percentage of winning votes in the Parliament which a group is part of. 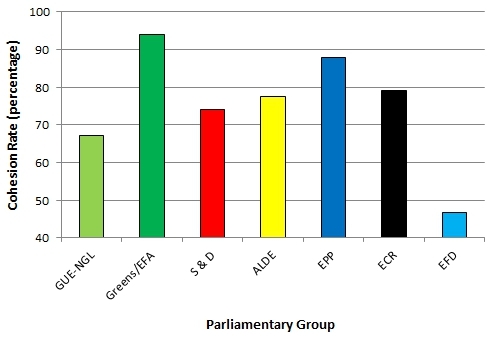 Inter-group dynamics also impact on the voting results in the EP. Since no group commands an absolute majority in the Parliament, coalitions are needed for passing legislation. In different policy areas, different winning majorities tend to emerge. For example, a centre-left majority usually dominates the civil liberties legislation area (Greens, S&D, ALDE), while on economic and monetary affairs the ALDE votes with the EPP and creates a centre-right winning coalition. Interestingly, on agricultural issues the two largest groups usually form a grand-coalition (EPP and S&D), while the more pro-free market groups, ALDE and ECR are left in a minority. How to track who represents you in Brussels? Access to information on the decision-making in the European Parliament is made easier by VoteWatch Europe, the independent organisation which monitors the voting records of the European Parliament and the EU Council of Ministers. VoteWatch offers access to an extensive database consisting of all roll-call votes (recorded votes) in the EP plenary. Knowing which groups dominate the key policy areas and what kind of alliances are more likely to emerge can help us foresee the shape and direction of EU legislation while in the making. VoteWatch Europe ensures not only that the information is accessible, but also that the public can make sense of it. To this purpose, the project Myvote2014 was recently launched, as a special tool which aims at translating EU politics for younger generations. MyVote2014.eu is a website that allows users to cast their votes on 15 issues voted on in the EP over the last five years. The selected votes regard subjects of interest to young citizens, such as harmonisation of national education systems, employment policies, immigration, nuclear energy or the controversial ACTA (anti-counterfeiting trade agreement), which are all explained in a simplified manner. The most appealing part of the process is that users can match their results with the votes of individual European deputies and determine who comes closest to their views. MyVote2014.eu hopes to reach a target of 3 million visitors by the time of the elections in May 2014. Both the President of the European Commission, Jose Manuel Barroso, and the President of the European Parliament, Martin Schulz, have praised the initiative and invited young people to use the website. While EU decision-making is complicated, it is also extremely important for more than 500 million citizens, whose lives are directly influenced by the Union’s legislation. By understanding how the show is run in Brussels and Strasbourg, the public can also decide on who should run the show in the 2014-2019 term on their behalf. More information on the topic covered in this article can be found at www.votewatch.eu and www.myvote.eu. Doru Frantescu is policy director and co-founder of VoteWatch Europe.